Saturday nights in the summer are usually spent at BBQ picnics or getting ready to go out on the town after a long work week. 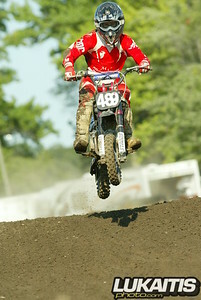 But for many New Jersey motocross racers, Saturday night is pit bike night and they are racing at Raceway Park. 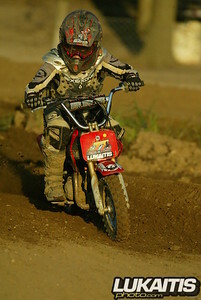 The pit bike series has been well received by the riders and families alike and although the competition is fierce in each class racers remember that pit bike racing is fun and high fives and handshakes usually wrap up each battle. The vibe is that of a great day at the races and everyone from young to old gets involved. Track manager Rich Schmidt even took some time out of his busy schedule. Rich used the skills that he teaches in his private motocross lessons to take the victories in both the 16+ 14/16” open regular class and the dash for cash as well. In the youngest class, 4-8 10” stock class, Sean Gillies showed that he was the top rider taking both moto victories along with the overall aboard his Honda CRF50. 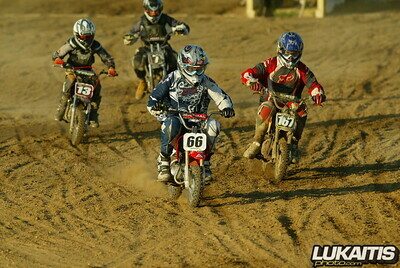 Local expert racer KPS backed Dakota Kessler was a double class winner taking command of both 16+ Open classes. MC Motorsports backed Jesse Pierce showed that he was the guy to beat in the 12-15 12” taking both motos over Freehold Honda backed JT Milne and MC Motorsports teammate Arthur Stryker. Pierce went on to take the victory in the 7-15 Youth Dash for Cash as well. The next pit bike race is September 15. Check out www.racewaypark.com for more details.